La cocinera Valentina prepara fantásticos platos de la tradicion italianas y piemontese como "Agnolotti con mantequilla, salvia y trufa" y "La Fagiolata" con salchichas y Carasau pan. Un rincón de Italia en el corazón de Barcelona. We came for New Year’s Eve and had the set menu. The food was delicious, especially the truffle ravioli starter and tiramisu desert. The staff are very friendly and accommodating. Thank you for an excellent evening! The owner was extremely nice, good italian guy. Food was excellent and recommendation were on point. The bill was very cheap for what we ate. Things to be improved: variety of on glass wine (only 1 option), and the vibe of the place (need decoration). I would 100% recommend. Cute and quaint dining experience. Would absolutely go back again! 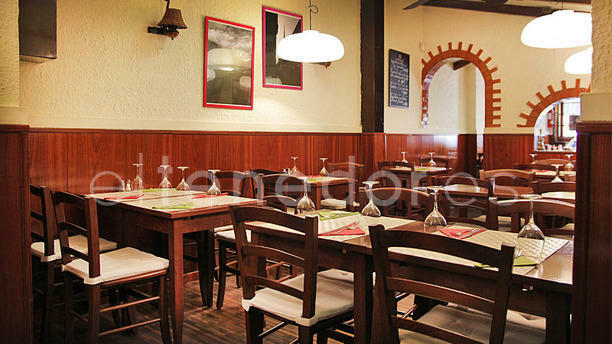 Small restaurant in a typically non-touristic zone of Barcelona with authentic italian food. They don’t serve pizzas but their pasta is fantastic. Excellent and friendly service. We’ll definitely repeat! Read the reviews so thought I had to check this out for myself. So happy to say I was not disappointed! Great little place! Staff were lovely and friendly and the food was amazing! Would definitely recommend this place to anyone. Very nice restaurant with very good dishes. The service is very attentive and kind. Extremely attentive and friendly service, very good value. Highly recommended and didn't disappoint. Owner was so attentive and helpful. Food was superb and plentiful. Can't recommend this restaurant highly enough. The food was good but the service was great. I don't think that we would come back again. Delicious italian food. Walking distance from Gran Torre Hotel Catalunya. Great Italian food prepared the way it should be. The restaurant itself lack a good atmosphere, feels more like a bar. The service was correct. The best italian I've been in my whole life, absolutely amazing. Really tasty, i cannot wait for the next time!! Fantastic italian restaurant! The owners were very nice and the food delicious.